College posters of New York City are popular dorm necessities. New York City has such a gorgeous skyline that you wish you could never look away from. With dorm wall art of that pretty skyline in your dorm essentials, you don't have to look away from it. Well...you do at some point to go to your college classes and study, but in between those times you can look at it! Scenic views in college posters add relaxing tones to dorm room decor. Even if the view is of a busy city, it still will add relaxation to your college wall decor because the views are so breathtaking! 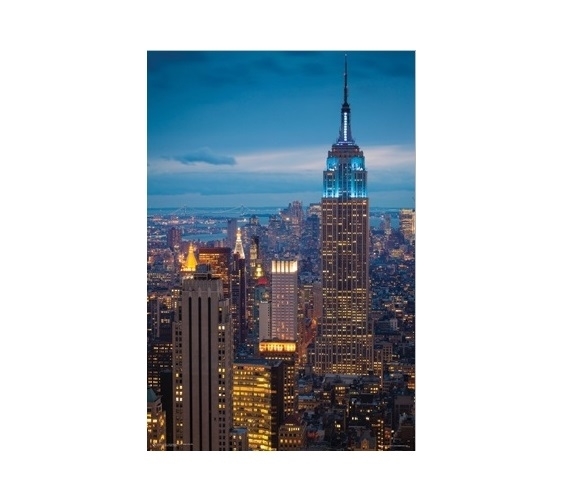 While the New York City skyline is a popular view for dorm wall art, our Empire State at Night Dorm Room Poster features a view that isn't often found in cool posters for dorm rooms. Which is pretty awesome, because you want your dorm room decor to be unique! This college supplies dorm item features an off center view of the Empire State Building, and it looks amazing. The Empire State Building is lit up with blue lights at the top which perfectly matches the gorgeous blue sky in the backdrop. If you love New York City, this dorm essentials item is a must have dorm item for amazing college wall decor!